With 400 million active users per month, Instagram Stories have become the protagonists of influencer marketing. Do you want to see how this went in our first campaigns? Visibility -There are more and more company accounts that are struggling to stand out and reach a wider audience. But users have a limit when it comes to how many accounts they can follow, in order to avoid being overloaded. In addition, Instagram has an algorithm to order these publications, which is something that has hurt companies. Stories have appeared as the solution to that loss of visibility, in addition to allowing for fresher content. Traffic – With the drop in traffic from Facebook, influencers with more than 10,000 followers and the possibility of including links in their Stories appear as a very appealing source for companies to get high quality traffic. 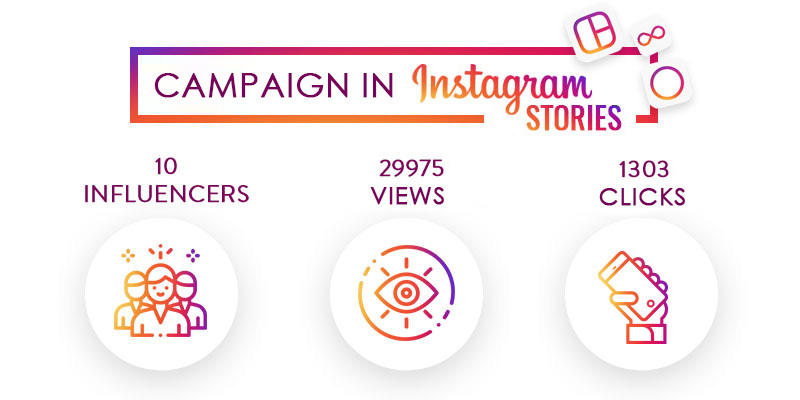 This summer we added Instagram Stories to our automated platform, and we’ve achieved very positive results in various campaigns. As the cover image shows, with 10 influencers it was possible to reach 29,975 users, which totaled 1,303 clicks (to the advertiser’s profile or to the link). These are real data, provided by the influencers themselves, and which show a very positive CPC, which adds to the authenticity and credibility they already offer. The influencers were chosen for their communities, their relationship to the advertised product or service. This was transformed into quality traffic, with many opportunitites for conversions. SEM campaigns or ads on social networks can also offer segmentation and interest, but don’t have the recommendation of a person that users trust. In addition, followers see Stories voluntarily, unlike the rest of the ads on the Internet. Influencer marketing can be the key to getting the best possible ROI.